January’s Full Wolf Moon takes the sky the morning of Thursday, January 12th. It’s the first full moon of 2017, making it an auspicious time to focus on intentions, new beginnings, and what you want to create for yourself as we begin a fresh year. Native American folklore suggests the January full moon got its name from the wolves who howled from hunger outside the villages. Are you ready to discover what your soul is hungry for? Many of you will be trying to get pregnant in 2017. If this is you, right now is your perfect opportunity to sow the seeds for the ultimate new beginning: conception. If you are not trying to get pregnant in 2017, you still have a powerful opportunity to clarify intentions for what you want to create in the New Year. The message we receive from the energy of the wolf moon is not to go it alone. Just like the wolf, we operate best as part of a pack. The wolf teaches us that we thrive the most when we collaborate within the systems that lift us and support us, be it community, family, work, or spirit. The darkness and harsh realities of the winter months are not meant to be faced alone. As the wolf energy fills the skies, this is the time to seek the support we need all around us to not only survive, but to thrive. 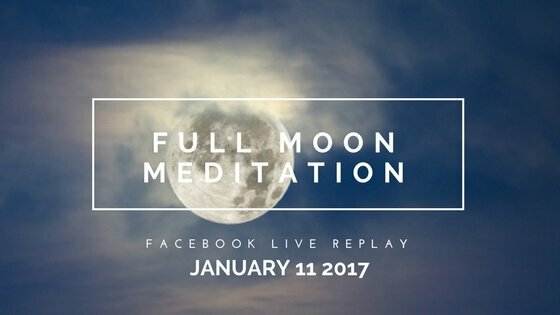 This full moon energy will stay with us for three more days, so if you weren’t able to join me live on Facebook the evening of January 11th, you can still take advantage of my Full Wolf Moon meditation – I would love to support you. Now pause, take a deep breath in, and let out your soul’s howl. If you are not already a part of our Yoga Goddess Facebook Support Circle, I invite you to join us: your pack is here. All the support you need is around you. May the Wolf Moon bring you magic this cycle, and may you be blessed with an abundant 2017!